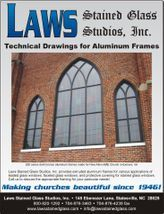 If your existing stained glass windows are sagging, bulging, cracking, or just need a good cleaning, Laws can restore your windows to the splendor of when they were first installed. With their expert craftsmanship, Laws can relead and clean your windows as well as match old broken glass. To protect your valuable windows from the outside elements and flying debris, we also offer protective covering. 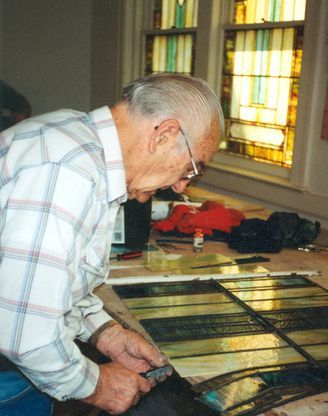 What is lead came in stained glass windows and long should it last? 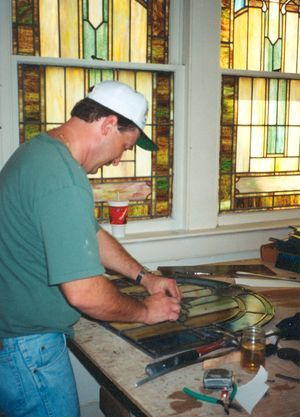 What are steel braces, steel reinforcing bars, or windbars in stained glass windows? Click here or the image to left to download the Technical Drawings for our aluminum frames. These drawings show the most typical application for our frames. We do modify our frames from these drawings to fit individual circumstances. Call us to discuss the appropriate framing for your particular needs!